Download the full list of results from each QLD-held competition in 2014. 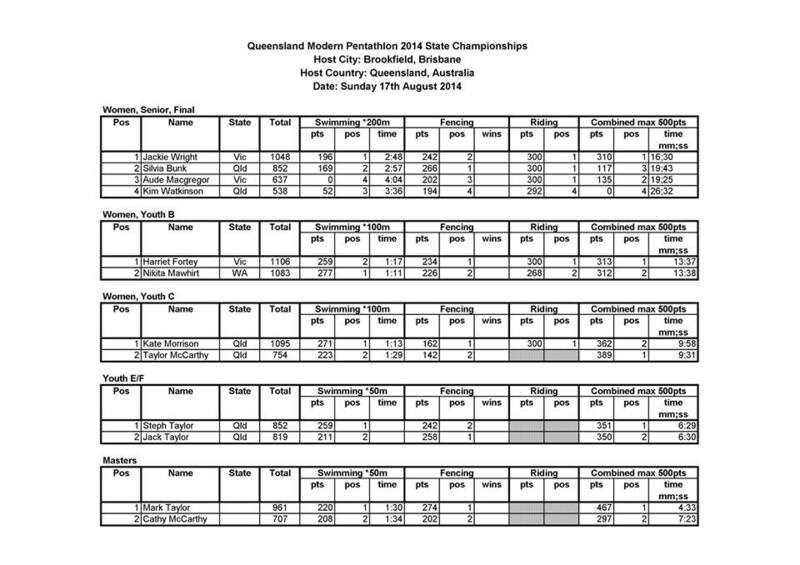 14/12/2014 – Modern Pentathlon Queensland/Australia Rio Olympic Team Selection Trial 1. Judge: Kate Thompson, Arkos. Location: Swim – St Peters College Indooroopilly; Fencing – Brookfield Showgrounds Hall; Showjumping – Riding for the Disabled Undercover Arena; Combined Event – Brookfield Showgrounds Main Oval. Judge: Jamie Webb. Location: Swim – St Peters College Pool; Fencing – Brookfield Showgrounds Hall; Show jumping – Brookfield Showgrounds Arena; Combined Event – Brookfield Showgrounds Main Oval.